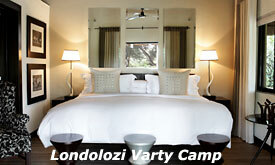 Londolozi Varty Camp was built on the site of the original hunting camp in tribute to the early beginnings of Londolozi, which has been in the Varty family for over eighty years. 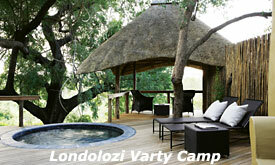 There are eight chalets and two superior chalets at Londolozi Varty Camp. 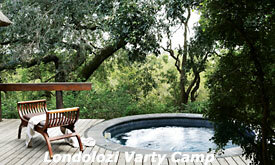 All rooms have private swimming pools framed by timber decks that overlook the riverine bush. The living spaces are raised off the ground and shaded under a cathedral of trees. The camp has a pleasingly down-to-earth quality and the emphasis on family heritage means that children always have a place at Varty Camp. The focal point of each luxurious bathroom is a capacious tub. 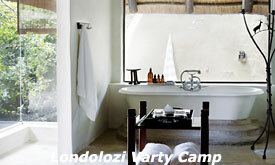 The essence of relaxation is to gaze from your bath over uninterrupted views of the surrounding bush. Also, the suites have underfloor heating and an outdoor shower as additional features. 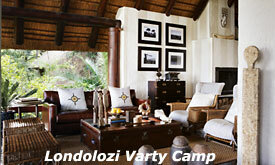 Varty Camp's shared living spaces exude the warmth and hospitality of the Londolozi legacy. Sepia family portraits on the walls speak of the adventure and hardships that laid the foundation for the present-day luxury. 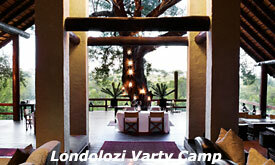 The lounge area at Londolozi Varty Camp has magnificent views over the Sand River. 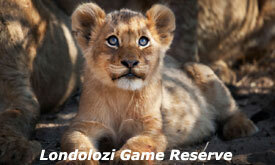 Londolozi is World famous for its close encounters with Leopard and other big game, and, in the company of your ranger, each game drive is an enriching experience. The enormous boughs of an ancient Ebony Tree emerge through the main deck, towering above the thatch roof. You can savour Pan-African cuisine in the dining area overlooking the flowing Sand River, or in the large boma (enclosed reeded area). Breakfast and lunch are served in the dining area or on your private deck. 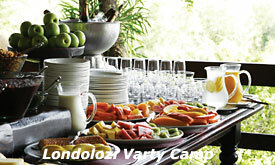 Dinner may be savoured buffet style in the boma or in a clearing in the bush.